There are a few restaurants that I’ve been wanting to go to for really quite some time, and Le Pont de la Tour is one of them. But the problem is, I live in SW18 and the restaurant is in SE1; an area I pretty much never find myself in. In fact, I’d go so far as to say that the last time I saw Tower Bridge that close was from a tourist boat (ahem – embarrassed little squeak) 20 years ago. So on Wednesday night the boyfriend and I had a table booked in the Bar and Grill at 7.30, I arrived at 7.35 having walked from London Bridge desperately trying not to look like a tourist while gawping, jaw on the floor at ALL THAT GLASS. I walked in the right direction, however, the boyfriend stomped in 20 minutes later after me having walked in the wrong direction and end up getting a cab! We were there, we were comfortable and we had a couple of drinks to keep us going while we mulled over the menu. Once we had ordered a couple of beautiful Amuse Bouche plates arrived. There was a glass containing a tomato jelly, some beautiful white crab meat and pea purée in those respective layers. Accompanying that was a gorgeously rich tea-cup of lobster bisque. My Moules arrived next, a good-sized bowl of the beauties. 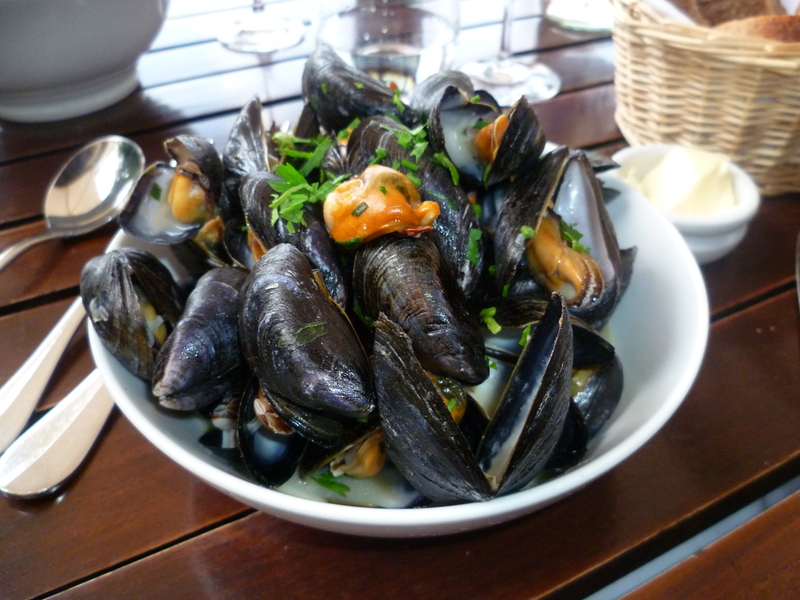 They were lovely, so often in London these days you get mussels that are just massive – too big (I am still talking about the shellfish) and not that flavourful, but these were normal sized and almost perfect. There was quite a bit of grit in them still but I’ve never had a bowl of Moules without any grit and the sauce was lush. The boy’s French onion soup was really good as well, I had a spoonful and it was beautifully sweet with hints of some possibly beef stock that may have been used (I’m sure I’m wrong on that one). Mains away! I decided to be greedy and go for the whole lemon. Now, tell me, is one supposed to share this? I didn’t ask, but I got a lot of food. I wish I’d asked them to take it off the bone for me as I did a bloody awful job of it (can one ask for this to be done these days – or is it assumed that us Londoners are so sophisticated that we know how to do it….? I do think there should be the option. The fish really was beautiful, melt in the mouth – there was garlic butter on the side but I used that mainly for my chips as the fish just didn’t need it. The boy went for the Dry Aged Steak – rare! It looked gorgeous with a peppercorn sauce – it was. Beautifully tender with the char taste from the grill and perfectly cooked. Ok, in hindsight the desserts were a little greedy of us, but the raspberry creme brûlée, the layered rhubarb panacotta and (um, yes there is an ‘and’ – 3 desserts between 2) the chocolate mousse with Morello cherry sorbet were just too good to turn down. This, in my humble opinion, is what city dining should be about. You go to the restaurant for the fine dining and you go to the Bar and Grill if you’re hungry! Head Chef Lee Bennett really has got the city boys sussed, whether they are using the company card or their personal cards they only need to go to one place and they can have the best of both worlds. Bennett’s grill menu is quite sizeable and really is reasonably priced for its location and status, so I imagine the bankers of Shad Thames could go in twice a week and not get bored with the choice. My little conclusion to this tale is that if, like me you don’t work in The City or indeed ever find yourself in SE1, you now have the perfect excuse to go there and why not pop into the Tower of London or on to HMS Belfast on the way.